We spent four days and three nights in Marrakech [December 28th to December 31st] and it felt like enough time to experience everything the city had to offer, though a longer trip could've allowed for a trip to Casablanca, or a night or two camping in the nearby Atlas Mountains. 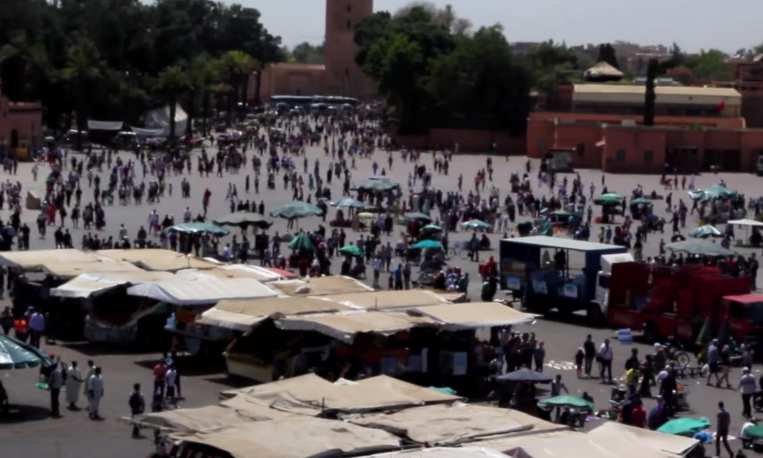 It's worth knowing that Marrakech has two 'city centres'. There is the old city, home to its most beautiful mosques and the famous souks (a neverending labyrinth of markets that sell literally everything.) The newer city centre isn't far away, but the atmosphere is entirely different. You'll see Starbucks and McDonalds and large hotels on either side of huge, palm tree-lined avenues. Accommodation is worth spending a little time looking into to make sure you get what you want out of Marrakech. We stayed in a traditional Moroccan Riad in the Medina (the older part of the city.) A Riad is basically a house with a courtyard and roof terrace. Ours had only five bedrooms. Riads are inexpensive and a surefire way to make you feel like you're actually in Marrakech, but they are located in cramped alleyways right in the middle of the Medina. I didn't feel safe walking outside mine at night, and never ventured out on my own. The most luxurious of Riads offer massage treatments, swimming pools, gardens and wonderful food. Our Riad definitely felt very far from a hotel; it felt like being a guest in someone's house and trying to remain quiet and unimposing. Let's rewind to the souks, if I may. 'Get Lost in the Souks' is the number one 'thing to do' activity for Marrakech when you find yourself Googling. And I can safely say we did that. We entered the souks in the famous Djemaa-El-Fnaa, and didn't emerge until many hours later. The most popular items we saw were slippers, beautiful lanterns, bowls and sweet confectionary. And everything else you could possibly think of. Haggling is the order of business, I'm told, but if like us you are just walking to experience this bizarre tradition, be warned: you will be talked to by every owner and if you get lost, directions may be misleading in order to keep you in the souks spending money. For someone who doesn't do particularly well in small spaces with lots of people, the fume-filled alleyways eventually got too much for me, (mopeds are very popular in Marrakech and they are everywhere) but it was still a highlight of our trip and like nothing I've ever seen before. I also enjoyed Morocco's food - vegetarians rejoice in homely couscous dishes and large tagines. Nice restaurants are inexpensive, and we found most menus to contain a few Moroccan dishes alongside pizza, pasta and burgers. Marrakech. Easily the busiest place I have ever been despite it being late December during our visit. Wonderful weather, good food, and an atmosphere that is impossible to describe (is that what all bad writers say?) Not somewhere I feel the need to return to, and the memories of being taken advantage of by a taxi driver and made fun of by strangers on the street will probably last longer than the beauty of Marrakech's skyline at sunset, sadly. One of the largest cities in Morocco, North Africa. Reachable by ferry from Spain, or by plane directly to Marrakech Menara Airport, 5km from city centre. Main languages are Arabic and French. Most people can also speak English, but it's worthwhile having some basic French phrases to politely say 'Merci!' etc. The currency is Moroccan Dirham. €1 = about 11 Dirhams. It is a closed currency so spend what you have left before returning to the airport. Keep the currency conversion in mind when purchasing anything, as 'tourist rates' are common and you don't want to be ripped off. Reaching highs of 37°C in summer, and lows of only 14°C in winter, pack sunscreen and drink plenty of water. Speaking of water, drinking tap water in Marrakech is a no-no.